Disclosure: This post is sponsored by Turning Leaf Refresh. All opinions are my own. I recently received the most delightful package in the mail: a Wine Over Ice Kit from Turning Leaf Refresh! Inside the kit was two bottle of delicious Turning Leaf Refresh wine (Red Moscato and Crisp White), two plastic wine glasses, a buffalo check picnic blanket, a wine carrier and some reusuable plastic ice cubes… now doesn’t that sound like fun? I was eager to try these wines. 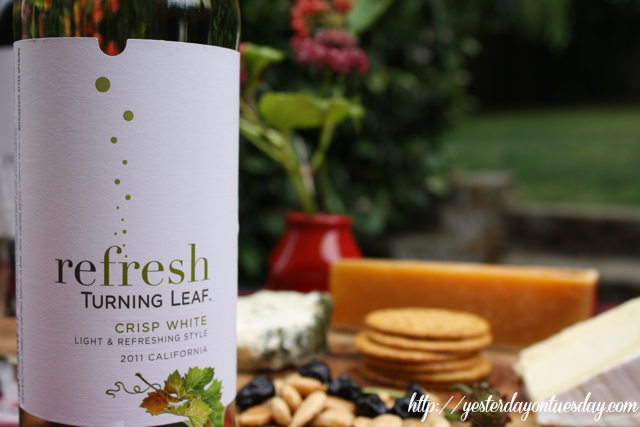 I enjoy drinking wine and was intrigued that Turning Leaf recommends that these wines be chilled and served over ice with a slice of orange or lime. Interesting, yes? It piqued my interest! There are four light and refreshing wine options: Crisp White, Red Moscato, Moscato and Pink Moscato all available at a great price– $8. 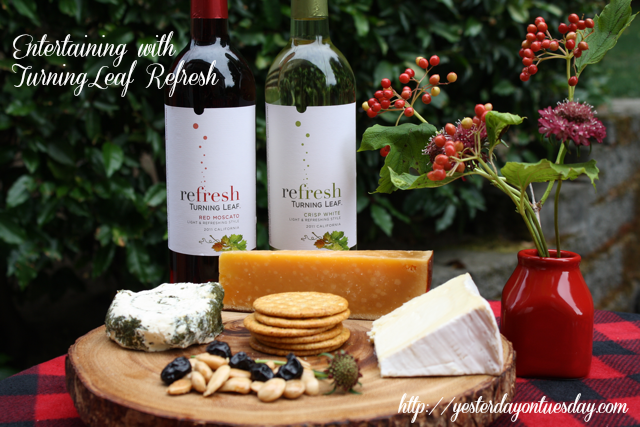 If you’re like me and love drinking a refreshment with fizz (but less filling than a wine or cocktail), Refresh is a great option. I sampled both of the wines that I received. The Crisp White tasted light and fizzy and sweet. I can imagine enjoying a glass with my girlfriends at brunch. The Red Moscato is also fizzy and has a nice fruity flavor. I will be buying more bottles of each! I wanted to come up with some ideas on serving these wines during a summer daytime occasion. I soon found that I was SO inspired, I came up with two ideas! 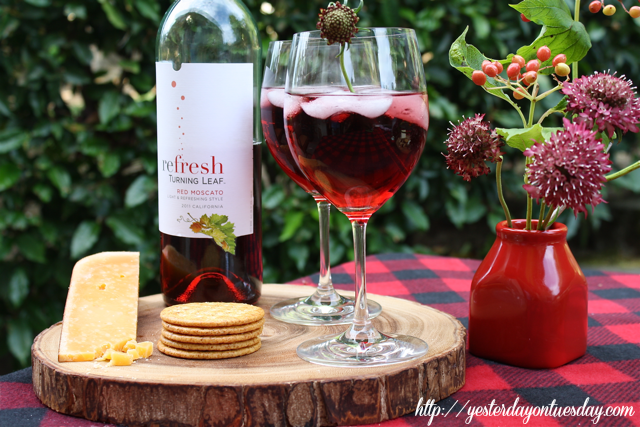 The first idea is to enjoy a wine and cheese picnic with items that work well with both the Red Moscato and Crisp White. First step– add ice to the glasses, then pour the wine! I tried to choose cheese and crackers and other goodies that complement both wines. You can’t go wrong with lightly salted almonds and dried cherries. The almonds are a nice balance to the fruit undertones of the wines and the the cherries enhance it. 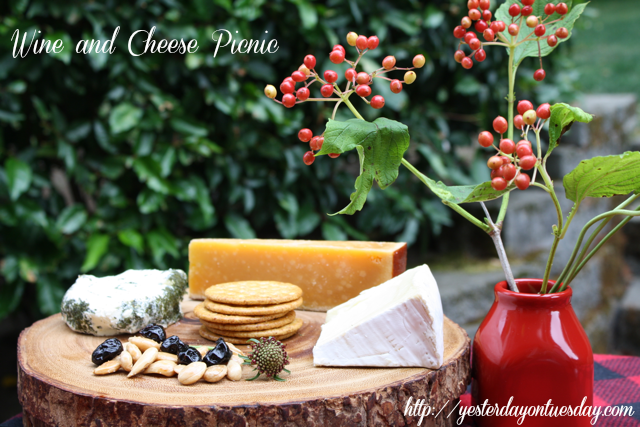 Add some herbed goat cheese, a chunk of Brie and some hard cheddar… you have a lovely wine and cheese picnic. 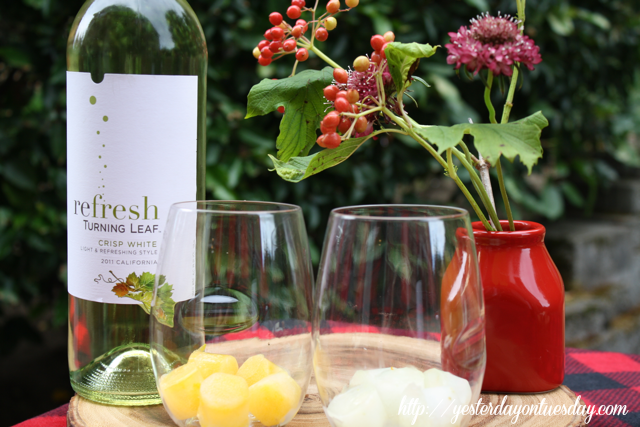 Since it is encouraged to serve the Refresh Turning Leaf wines over ice and with a slice or orange or lime, I decided to take it a step further and create Fruit Infused Ice Cubes to accompany the wine. Supplies: An ice tray, sparkling water, a juicer, grater and a lemon and lime. 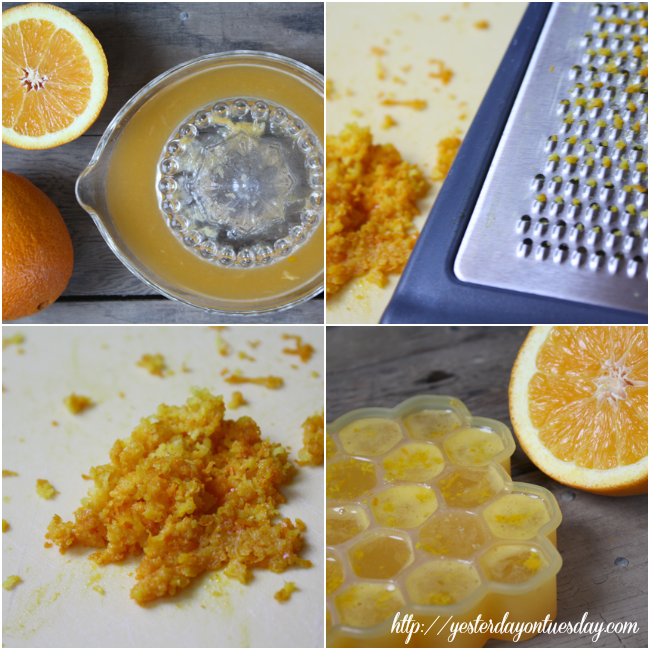 Juice the orange then grate the rind. Combine 1 cup of sparkling water with 1 cup of freshly squeezed orange juice. 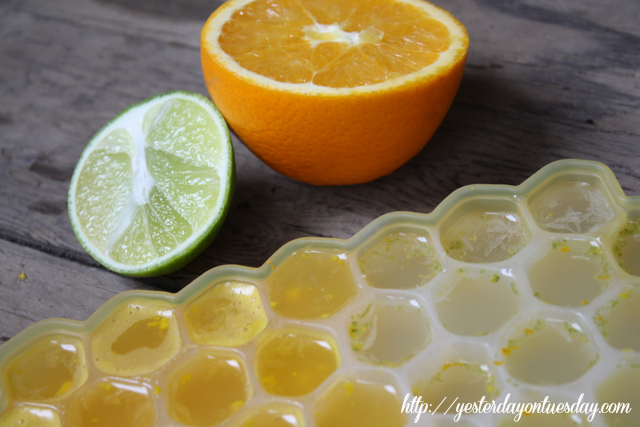 Carefully pour into the ice tray and sprinkle a little grated orange peel on top. Repeat with the lime. 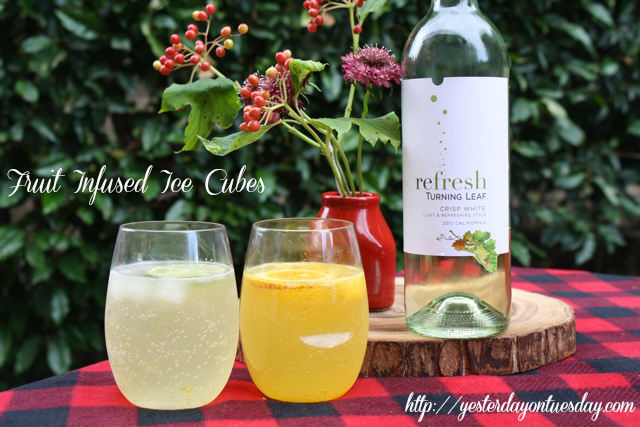 Add the ice cubes to the glasses..
As part of this campaign, I have the opportunity to “Refresh it Forward” to a friend and fellow blogger… Mary Beth from Cupcakes and Crinoline. Mary Beth will also be receiving the wine to review! Thank you, Turning Leaf Refresh and Mom It Forward! I would love to have my tennis team over for wine drinking and snacks. We’re celebrating our 14th anniversary. So this would be perfect for that. I would love to enjoy a glass with you – that looks so relaxing!! I love Moscoto!!! I would love to sip a glass while sitting on the patio outside grilling some dinner. Thanks for the great giveaway!! That looks right up my alley! Yummy. I love lighter wine that it is okay to bend the rules a bit on. We make homemade wine we called Citrus Splashes they are basically an alcoholic fruity lemonade. They are so amazingly fun because we can freeze them, add ice, add sprite, add whatever we want and just enjoy. I’d love to enjoy these wines around our firepit at night! I’m excited about this Refresh line! Thanks for telling us about it Malia! I’d love to celebrate my parents’ return after their LONG summer away! You have sparked my interest ~ we’ll be going to a Birthday party tomorrow ~ I hope I can find this locally. I would love to give a bottle (or 2) to the hosts. A beach picnic for sure! I love the idea of wine that you serve over fruit – it’s like quick and easy sangria! 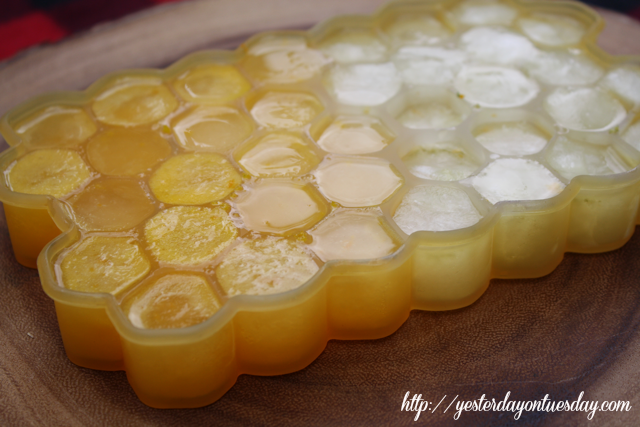 And your fruit infused ice cubes are genius! I need to make up some to keep on hand – just for adding to my water. Thanks! Malia, your photos are so beautifully styled! 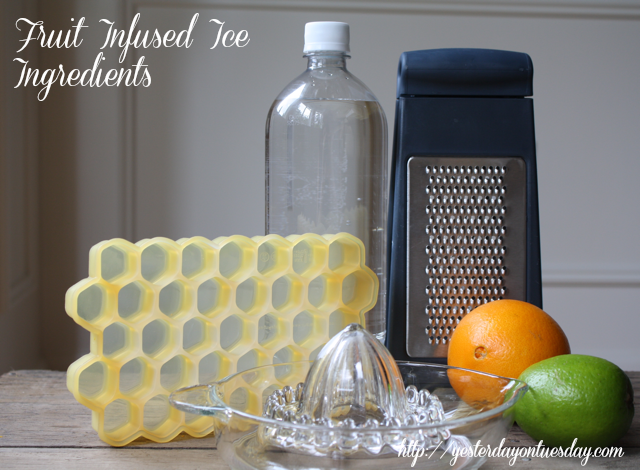 Love the idea of the infused ice cubes. 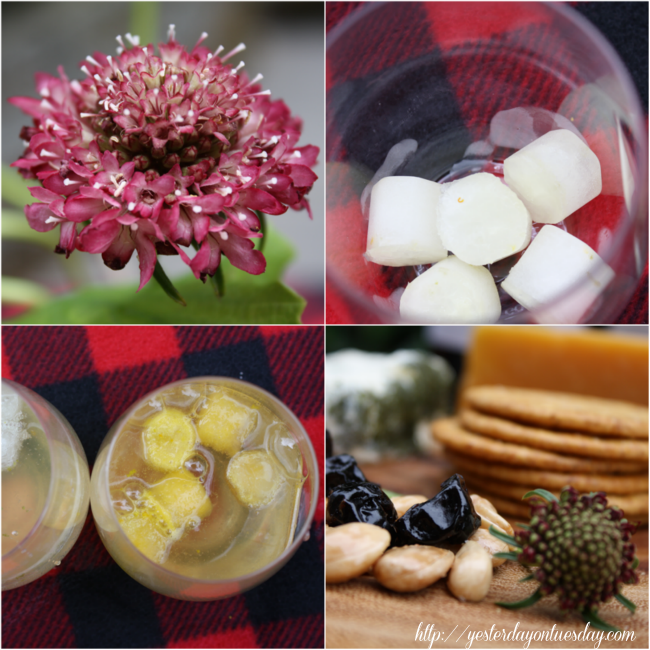 The iced wine sounds delicious and I love the cheese pairings!